Israel Knohl provides his full English translation of Hazon Gabriel here. A drawing of the inscription can be found here. It’s a difficult text to understand in any specificity, due to the gaps. But lines 19ff seem to refer to the eschatological arrival of the God of Israel within “three days”, together with the head archangel Michael and the other(?) three archangels. As this meaning is relatively clear and the text unbroken, shouldn’t the far more broken lines 80-81 be interpreted as also referring to the same or similar eschatological arrival after three days by Michael (there called “The Prince of Princes”)? That is, the arrival will be in glory, on chariots from heaven, accompanied by God Almighty. The context supports this interpretation, while Knohl’s interpretation relies on the controversial reconstruction of hayeh (interpreted as the imperative “live!”). If Israel Knohl could also make a photograph available, that would be handy to judge the issue, too. Israel Knohl’s latest article in Tarbiz can be found here, which includes the Hebrew transcription for Hazon Gabriel. Thanks to Jim West for noticing it first. Hazon Gabriel – Who is ‘The Prince of Princes’? 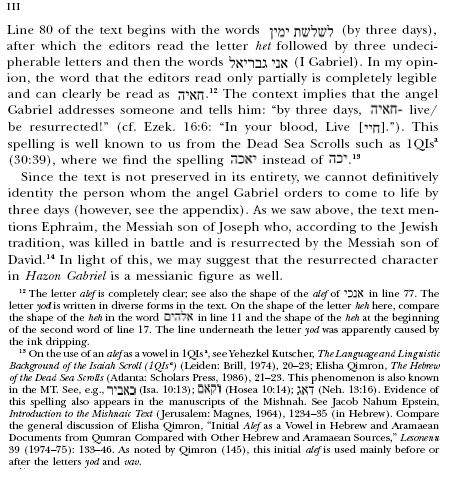 Line 81 of Hazon Gabriel (“The Vision of Gabriel”) refers to Sar Hasarin (“The Prince of Princes”). 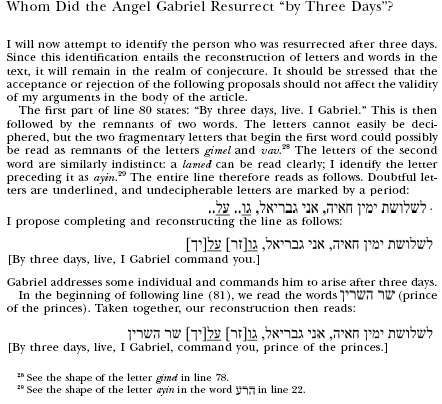 The sentence in which the phrase appears, as reconstructed by Israel Knohl, reads Leshloshet yamin hayeh, ani Gavriel, gozer alekha, sar hasarin (“In three days, I, Gabriel, command you, prince of princes: live!”). As discussed elsewhere, Israel Knohl’s reading of the inscription has not (yet?) received widespread acceptance, and he relies on a reconstruction of some key gaps in the text. In particular, the all-important translation “live!” relies on a word for which only the first letter is partially visible according to the original editors, has to be understood in the imperative for Knohl’s interpretation to work, and is an unusual use of the verb if it refers to resurrection (wouldn’t “stand!” be more likely?). I haven’t seen a photograph of the original, but if the first het of the word is only partial, the word could be almost anything. What is more, Knohl’s “Prince of Princes” must be understood as a mortal, for his interpretation to be feasible. But the term first appears in Daniel 8.25, where it refers to an angelic being against whom Antiochus IV Epiphanes dared to act arrogantly (cf. Dan 8.11). In Daniel, Michael is identified as the angelic “prince” of Israel (Dan 10.13, 21; 12.1). The angel who reveals this to Daniel in a vision is likewise identified as Gabriel (Dan 8.16; 9.21; 10.5-6). Most of the contemporary literature supports the identification of the Prince of Princes with Michael, the primary eschatological defender of Israel. Michael’s essential function in Jewish tradition was as “heavenly protector and champion of the Jewish nation”. He was the archangel responsible for the protection of the chosen people against other hostile powers, and the sole contender against the angelic evil “princes” of Israel’s enemies (1 Enoch 20.5; Dan 10.21). Michael undertakes his role of protector as the highest and chief angel of heaven, and commander-in-chief of the heavenly angels (Dan 12.1; 1QM, Rev 12.7; 3 Bar 11.4-8; 2 En 22.6; 33.10; T. Abr). Darrell Hannah notes that, “already by the beginning of the first century AD, Michael had become the principal angel, if not everywhere, at least in many circles” (Michael and Christ, 48). He is called archistrategos (“commander-in-chief”) throughout the Testament of Abraham (A). In the Similitudes of Enoch, Michael is described as “the first” angel. Michael is the highest archangel in 3 Bar 11.4-6, receiving veneration from fellow archangel Phanuel. He is recognised as head angel in all but a few texts (Pr. Jos, Apoc. Abr, Apoc. Zeph., Astrom. Bk 74.2; 75.3; 79.6). Michael is attacked by the evil king in the eschatological end-times battle, which gives occasion to his arrival on earth for the deliverance of the righteous and receipt of the kingdom from the powers of evil (Dan 8.10-11; 11.36; Dan 12.1). In the Book of Dreams (c. 164 BC), Michael binds the leader of the rebellious angels in the abyss, records the actions of the shepherds who overstep the mark against God’s chosen people, and intercedes for his “sheep”, assisting the righteous Israelites in the final battle, and delivering the evil powers for judgment in the heavenly court (1 Enoch 88-90). In the Assumption of Moses, when the Kingdom of God appears at the end of times, an angel “who is in the highest place appointed” will “avenge [Israel] of their enemies”, and “then the devil will have an end”, before raising the people of God to the heavens (10.1-2, 9). The close parallel with the angel Michael’s role in Dan 12.1 identifies the angel of the Assumption of Moses as Michael. Hannah also notes that the reference to “his hands will be filled” (implebuntur manus) refers to priestly ordination (cf. Exod. 28.41; 29.9; Lev. 21.10; T. Levi 8.10), which agrees with Michael’s role in the heavenly sanctuary. Again, in T. Dan 6.1, the “angel who intercedes for you” who is “the mediator between God and men for the peace of Israel” is predicted to “stand in opposition to the kingdom of the enemy”, and bring Satan’s kingdom to an end. Likewise, in the War Scroll, God is described as destroying Belial (also referred to as “the Prince of the Kingdom of Evil”) in an eschatological battle, through the agency of the archangel Michael. The Priestly Messiah tells his soldiers that God will humiliate Belial “through the power of the majestic angel of the authority of Michael” and that God will “exalt the authority of Michael among the gods” in order to restore the people of God (1QM 17.5-8). In 11QMelchizedek, Melchizedek is presented as “an angelic figure and eschatological saviour”, who stands at the head of the angelic Sons of Light, exercises a priestly function in heaven, makes atonement and delivers judgment, in a way that identifies him with the lead angel Michael (2.8). As in the War Scroll, Melchizedek is said to “exact the vengeance of God’s judgments and … protect all the sons of light from the power of Belial and from the power of all the spirits of his lot” (2.13). Melchizedek conquers Belial, proclaims liberty, and provides relief from iniquities (2.6) and expiation for the sons of light (2.8), and then reigns as king. Of course, Melchizedek is also employed in the Christian Letter to the Hebrews, in order to identify the nature and functions of Jesus Christ. In 11Q11 (11QApocryphal Psalms a) 3-4, Yahweh is to send “a powerful angel” or “the chief of the army” to evict Belial from “the whole earth”, to hurl Belial into the great abyss, where he will be shut in forever. A further text from Qumran, 4Q‘Amram, pits “Belial, The Prince of Darkness and Melchiresa” against “Michael, The Prince of Light and Melchizedek” in a battle over the soul of ‘Amram after his death. Michael is also the chief legal advocate for the people of God against Satan. In the lost ending to the Assumption of Moses (identified from Jude 9 and Origen, Princ. 3.2.1), Michael contests Satan’s claim to the body of Moses, opposing Satan’s claim that Moses belongs to him because Moses had sinned by murdering the Egyptian, and Michael denyies that Satan has a right to humanity as Lord of Matter. Michael also functions as intercessor for humanity at the right hand of God. His righteousness, together with Abraham’s righteousness, atones for the sins of certain souls in the Testament of Abraham. Rabbinical literature denounces the practice of praying to Michael or Gabriel as an intercessor (y. Ber 9.13a; Abod. Zar. 42b). An earlier instance of prayer to Michael is recorded in Joseph and Aseneth. Aseneth’s prayer of repentance is heard by the Morning Star, the pre-eminent star/angel in the host of heaven. In Joseph and Aseneth, the Morning Star is identified as “the chief captain of the Lord and commander of the whole host of the Most High” (14.8). This results in Aseneth’s veneration/worship of the lead angel (15.11), and praise to him for rescue “from the abyss” (15.2). Although not explicitly identified as Michael, the identification is highly probable, and the angel is prayed to and venerated by Aseneth, and described by Aseneth as “(a) god” come down from heaven (17.9). Likewise, Jesus takes for himself the title of pre-eminent host, the Morning Star in Rev 2.28; 22.16 (cf. 2 Pet 1.19). “Morning Star” is the title given to Satan before his fall, according to first-century exegesis of Isa 14.12. Justin claims that Jesus existed before the Morning Star as well as other angelic hosts such as the moon (Dial. 45). Ignatius explains that Jesus had been hidden from Satan, and when he became incarnate, it was announced to the world/aeons by “a star that shone forth” in heaven brighter than all the stars” (Eph. 19.2). The other stars, the sun and moon “formed a chorus around the star”, yet it outshone them all (Eph. 19.2). Melito explains that Christ “is the firstborn of God, who was begotten before the Morning Star” and in fact created the stars and angels (82). This is not to deny that there are changed emphases and different ways of combining the traditions in the Christian tradition which differentiate the Christian tradition from others. The Christian tradition cannot simply be reduced to its background, but instead the distinctive way it interprets and rearranges the tradition must be acknowledged. Given Christ’s identity with The Angel of Yahweh, and also with the exalted attributes of God’s Glory, Name, Wisdom and Word, his affinity with God was unequalled in the contemporary literature. But given the extent of continuity with the angelic traditions, the function, if not the person, of Christ should be viewed more as a natural evolution than dramatic mutation from the earlier Jewish traditions. As for Hazon Gabriel – if genuine (and although unprovenanced) – it adds to our knowledge of first century apocalyptic and messianism. But it probably doesn’t do so in the precise and direct way that Israel Knohl proposes. Posted in Apocalyptic, Early Christian literature, Early Jewish literature, Eschatology, Gospels, Hazon Gabriel, Jesus & Christ | Comments Off on Hazon Gabriel – Who is ‘The Prince of Princes’? Together they are … Biblical Scholars. The New York Times has picked up on the Hazon Gabriel (“Vision of Gabriel”) tablet, and in particular the interpretation being offered by Israel Knohl in “By Three Days, Live”: Messiahs, Resurrection, and Ascent to Heaven in Hazon Gabriel.” The Journal of Religion 88 (Apr 2008):147–158). “A three-foot-tall tablet with 87 lines of Hebrew that scholars believe dates from the decades just before the birth of Jesus is causing a quiet stir in biblical and archaeological circles, especially because it may speak of a messiah who will rise from the dead after three days. The writer of the article is quite aware that the interpretation of the tablet as concerning a messiah who would resurrect after three days is still some way from being affirmed. In particular, the gaps in the text require readers of the tablet to reconstruct the missing words, as discussed in my previous post. Moreover, because of the broken and uncertain context, it is uncertain who is saying “live!” to who, even if “live” can be properly restored in the gaps. So, even in the long term, the measured conclusion may be that we just cannot tell what the tablet originally said. Time will tell. Still, if the tablet does talk about an anointed one (messiah) who will rise from the dead, it is very significant for our interpretation of beliefs in Jesus in the first century AD. 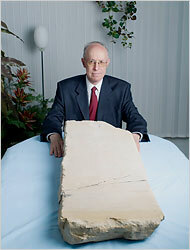 The tablet is dated before Jesus’ birth, in the late 1st century BC. “Daniel Boyarin, a professor of Talmudic culture at the University of California at Berkeley, said that the stone was part of a growing body of evidence suggesting that Jesus could be best understood through a close reading of the Jewish history of his day. Although, the idea of an anointed king who serves at the side of the High God and returns from the dead after three days is one that can be traced back at least to 1200 BC in Syria-Palestine. N T Wright on Comedy Central – The Last Anglican Straight Man? On Thursday 19 June, 2008, Bishop N T Wright was interviewed by Stephen Colbert on Comedy Central. The subject was the Bishop’s latest book, Surprised by Hope, and the topic of Heaven. N T Wright was playing the straight man to Colbert. This is an unusual role for a bishop to assume in the Anglican Church these days, unless he’s Nigerian. But N T Wright played the role well, and even slipped in a fine gag about the possible title of Hillary Clinton’s forthcoming book. N T Wright: “Well, the New Jerusalem, but at the end of the Bible, The New Jerusalem comes down from Heaven to Earth, so that Heaven and Earth get joined and made over. Max Blumenthal’s short documentary, “Rapture Ready: The Christians United for Israel Tour” (9:57) is available on YouTube. They’re scary folk. Israel Knohl has recently claimed a pre-Christian prophecy of the resurrection of the Messiah from the dead after three days, based on his interpretation of a recently discovered text (Hazon Gabriel – The Vision of Gabriel). The interpretation rests on a significantly reconstructed text, so is still somewhat speculative. But if Knohl is correct, and his reconstruction is certainly at least worth suggesting, then the text would be important evidence of one of the trajectories of development in messianic thought in early Judaism. However, the idea that it takes the messiah three days to come back to the world of the living employs a very familiar mytheme. The idea that the dead take three days to return to the world of the living is a familiar one. The time period of three days is often given as the distance between the netherworld and earth. A very relevant example is in the Ugaritic Rephaim Texts (KTU 1.20-22) from ca. 1200 BC. It is very relevant, because the Ugaritian and biblical traditions share a broadly common geographical locale, many common beliefs and traditions, and a broadly similar language (although are separated by some 500+ years). The traditions about the Rephaim (Saviours) are included in the biblical books with very similar accompanying mythological themes (Job, Psalms, Proverbs, Isaiah). The picture here, although from another fragmentary and uncertain text, is of the 3-day journey from the netherworld to Ugarit by the long-deceased heroes (-kings) who were the deified heroic ancestors of Ugarit. In some sense, they appear to have blessed Ugarit at the the cultic feast here on earth by their presence. Note that the dead return after sunrise on the third day. Now read Mark 16.2. Given the Messiah’s/Michael’s function as defeater of death, it is unsurprising that this mytheme should recur in respect of a Messianic resurrection account from the first century BC. Note the mythic concatenation of themes of sea-monster–heart of the earth–three nights—Son of Man in Matthew 12.40. Sounds to me like it was based on an apocalyptic-mythic prophecy which employed these mythic themes. Do you have bright yellow highlighted passages in your Schofield Chain Reference Bible? Does the highlighting start to get excessive when you get to the book of Revelation? Barbara Rossing explains how the idea of the supposed “Rapture” is pieced together from Bible verses taken from different contexts, to make an artificial whole. She calls it “pick-and-choose literalism”.